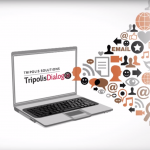 Home » Portfolios » How to set up A/B-testing in Tripolis Dialogue? A/B testing is an effective method to obtain more insight in the conversion of your email marketing activities. Using an A/B test, you can test different versions of the emailing. For example: subject line, sender name or call-to-action buttons. That way you can analyze which features or changes in the newsletter or direct mail give better results and a higher ROI. The integrated A/B testing tool of Tripolis Dialogue works using a wizard where you can easily change the size and quantity of the test groups.